Jeremy Chamberlain received his B.S. in Biology from the Iowa State University (2009), his M.S. in Biology from the University of Texas at Tyler (2011), and his Ph.D. in Applied Bioscience from the University of Arkansas at Little Rock (2016). His dissertation work focused on understanding how variation in prey availability among populations of water snakes shaped their life-history patterns. 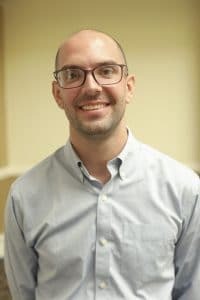 After earning his Ph.D., he worked as a Visiting Assistant Professor at the University of Arkansas at Little Rock (2016-2018). His research interests are broad but focus on physiological responses of animals to environmental change. Most of his current work examines variation in energy allocation patterns to components of the life-history. As a herpetologist, his research often utilizes reptile and amphibian models, as these taxonomic groups are under-represented in ecological and physiological research. Additionally, Dr. Chamberlain is interested in exploring the distribution of reptiles and amphibians in Arkansas and the surrounding area, with a focus on conservation and public outreach. He teaches Human Anatomy and Physiology I & II, Vertebrate Physiology, Zoology, Vertebrate Zoology, and Herpetology.